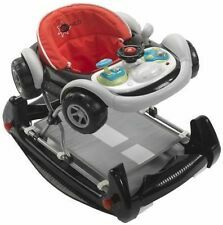 Bebe Style Deluxe 2 IN 1 F1 Racing Car Baby Walker/Rocker +Musical Activity Toy! HIGHEST QUALITY!! HIGHEST SAFETY!! HIGHEST VALUE!!! 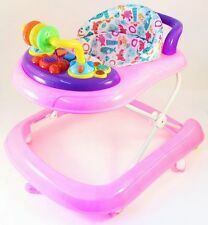 4 out of 5 stars - Bebe Style Deluxe 2 IN 1 F1 Racing Car Baby Walker/Rocker +Musical Activity Toy! 5 product ratings5 product ratings - Bebe Style Deluxe 2 IN 1 F1 Racing Car Baby Walker/Rocker +Musical Activity Toy! 4.5 out of 5 stars - Bebe Style Deluxe 2 IN 1 F1 Racing Car Baby Walker/Rocker +Musical Activity Toy! 26 product ratings26 product ratings - Bebe Style Deluxe 2 IN 1 F1 Racing Car Baby Walker/Rocker +Musical Activity Toy! From 9 months, in the middle position, with the wheels blocked, baby learns to stand alone, to be able to play with the 2 spin bars located on the handle. - from 12 months, in high position, the wheels unlocked, baby will learn walking. With textured wheels, an easy grip handle, and a durable design, the sturdy walker gives all the support they need to take their first steps. The fun-filled activity panel can also be removed from the walker for extra sit-down play. With lots of exciting activities, cheerful music, and friendly phrases, little ones will be introduced to numbers, shapes, animals, and colours Features: 4 In 1 Multi Functional Baby Musical Play / Feed Station & Push Walker AGE: 4 Months Function 1 :Play Station: Sit on the floor and play ( Front Wheels Folded ) . Used Mothercare Blue Car Baby Walker 3 in1 in VGC. Car has been used by our son who loved every minute in the car and then used it to aid his walking. All the sounds still wotk and you can turn them off when they start to annoy you lol. The seat cover has been washed ready for your little one to enjoy. Collection from N1. May be able to deliver if not too far away. Good luck bidding! VTech 2 In 1 Children's Musical Activity Centre Push Along Walker. Condition is Used. Great little walker, one of my kids favourite toys. Play sitting up with the activity centre before being able to walk then pull up on it before taking babies first steps pushing the walker along. Good condition full working order and low starting price so grab a bargain! Please check out my other items Happy bidding! 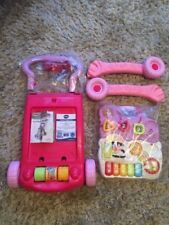 Vtech First Steps 2 In 1 Children's Musical Activity Centre Push Along Walker. Good condition. Music and lights in working order. Front activity panel detaches for easy play. Mine loved playing with this toy and it was great to help their walking. Quickdraw 2 In 1 Children's Musical Activity Centre Push Along Walker. Condition is Used. Condition is Used. Great Little Baby Walker. 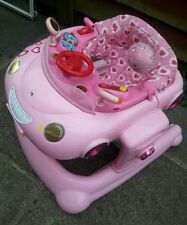 Bebe Style Car Adjustable 3 Height Positions Walker 6 Months. Condition is New. Baby walker features: Can be adjusted in height to suit the build of different children and ensure their feet touch the floor correctly, as recommended by paediatricians. Removable entertaining car electronic toy, with sounds, lights and manual activities. Adjustable seat and padded abdominal protection. Seat can be adjusted to 3-height positions. Safety pads to stop against falling down stairs. Back support for baby's comfort. 3 height positions. Size H42, W70, D64cm. Weight 4kg. Suitable for babies up to 12kg. Walk, rock, bounce and spin! The 360 degree rotating seat allows baby to explore exciting, colourful toys designed to stimulate the senses with a range of textures and sounds. With activities to turn, slide, rattle, grab, push and even chew, they develop cognitive and fine motor skills whilst keeping baby entertained. The Sensory 3 in 1 Baby Walker encourages detect, seize and walk on. Tons of fun, colours and activities including a mini ball run & a mini shape sorter. 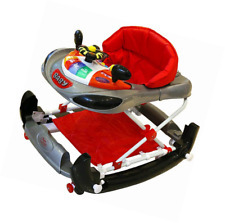 The B-Sensory Kids 3 in 1 Baby Walker runs on 2 AA batteries (included). Put your child in pole position with the Coupe Walker from MyChild. Baby walker features Children love make-believe. With a steering wheel to turn and a horn to honk, baby can drive along - just like you! Stepp is equipped with a whole set of activity toys that can be easily accessed from the 360­° rotating seat. 360° rotating seat – it allows your child to admire the world around and to easily access the toys at the back of the walker. This amazing 3-in-1 baby walker supports both novice and more experienced walkers. One baby can play in normal walker mode to encourage gross motor skills, while more advanced walkers can use the push-behind mode! This classic Volkswagen camper van - style red Walker is perfect for adventurous toddlers and brave babies! whether learning to walk or simply pushing their favourite toys around, your child will love this stylish Walker! 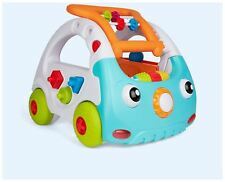 Bebe Style Car Adjustable 3 Height Positions Walker 6 Months. Condition used clean full working order 6 months of age maximum weight is 12kgs Item number CCW3016BR instructions and boxed.and safety tag. With two modes of play, Charlie Sky Rider will grow with your little one! Chicco Charlie sky rider as pictured. Great ride on in like new condition since this has only ever been used indoors. Cash on collection preferred. Easy storage due to the ability of folding the walker flat. Stepp is equipped with a whole set of activity toys that can be easily accessed from the 360­° rotating seat. 360° rotating seat – it allows your child to admire the world around and to easily access the toys at the back of the walker. My Child Coupe Walker Rocker Car Black for Kids, Children, Toddler, Baby, Boy. My Child Coupe Walker Rocker Car Black for Kids, Children, Toddler, Baby, Boy. . Condition is well Used. Few scrapes and scratches. Price reflective of this. 5 out of 5 stars - My Child Coupe Walker Rocker Car Black for Kids, Children, Toddler, Baby, Boy. 4 product ratings4 product ratings - My Child Coupe Walker Rocker Car Black for Kids, Children, Toddler, Baby, Boy. 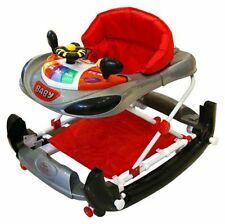 B Kids 3 in 1 Baby Car Walker. This classic Volkswagen Camper Van - style red walker is perfect for adventurous toddlers and brave babies! Whether learning to walk or simply pushing their favourite toys around,your child will love this stylish walker! 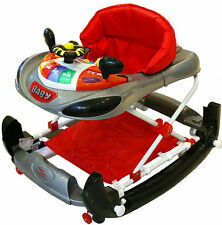 Baby walker features Removable extra soft padded seat to support baby while they play and move around. Back support for baby's comfort. Rotating wheels and speed stripe stickers add a real sense of fun. Hape Beetle Walker Red E0380. Now your child can have a car of their own! Whether learning to walk or simply collecting their favourite toys around the house, your child will love this Beetle walker from Hape! Quickdraw 2 In 1 Children's Musical Activity Centre Push Along Walker. Condition is Used. Dispatched with eBay delivery – Shutl 1 day. And, because we know that nothing is more important than your baby's comfort, we've given our walker a comfy seat with multiple height positions to grow with your pint-sized pilot. 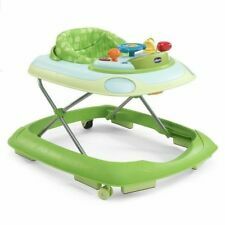 Features and benefits for mothercare plane walker. 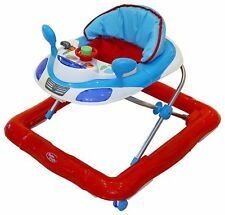 Bright Starts Baby Walker 3 Ways to Play Ford F-150 Red Walk Learning K10630. Condition is Used. Collection in person only. Bebe Style Deluxe F1 Racing Car Walker and Rocker, Grey/Red. Includes fantastic removable car toy to play with whilst on the move. 2 IN 1 Walker and Rocker - Simply pull the white knobs on the side, and convert to rocker! In excellent condition. Cash on collection.